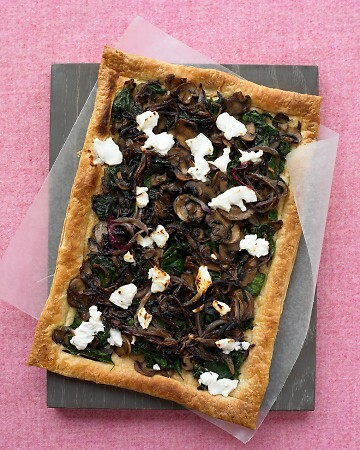 Mushrooms, spinach, onion, water melting flecks of goat cheese and store bought puff pastry. This recipe is so easy to make, even if you dont have a lot of time. Personally this combination of flavors leave me with out words. What are your favorite salty combinations? Preheat oven to 400 degrees. On a floured surface, roll the puff pastry out to a 16-by-10-inch rectangle. Trim uneven edges. Place the pastry on a baking sheet. With a sharp knife, lightly score dough to form a 1-inch border. Using a fork, prick dough inside the border every 1/2 inch. Bake until golden, rotating pan once, about 15 minutes or until tender. Meanwhile, in a small saucepan with a tight-fitting lid, toss onion with 1 tablespoon oil. Season with salt. Cover and cook over medium heat until onion begins to brown, about 5 minutes. Stir. Continue cooking with cover on for 15 minutes, stirring every 5 minutes. Set aside. In a large saucepan with a tight-fitting lid, heat remaining oil. Add mushrooms; cover and cook until tender and all liquid has evaporated, about 10 minutes. Fold in spinach; season with salt and pepper. Cover and cook until wilted, about 5 minutes more. Drain any liquid.